In Canada, Indigenous people experience higher rates of injection drug use and less access to health care than non-Indigenous people. For many Indigenous people, drug use offers a means of coping with traumatic life circumstances, including those related to their experiences with the residential school and child welfare systems in Canada, legacies of colonialism and racism, and childhood traumas. Harm reduction is proven to engage Indigenous people who use drugs with care, treatment and support. 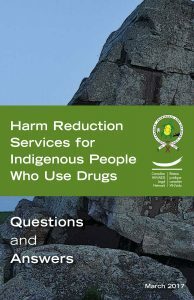 This guide provides you with information related to harm reduction services such as needle and syringe programs, safer drug consumption services, opioid substitution therapy (e.g., methadone) and naloxone. This entry was posted in Booklets, Drug policy, English, French, Indigenous Communities, Our Work, Pub Document Type, Pub Language, Publications, Q&A. Publication Topics: Drug policy, Indigenous Communities. Bookmark the permalink. Both comments and trackbacks are currently closed.